Interactive Alabama map with cities for WordPress with Text labels, created with Google Interactive Maps WordPress plugin with Zoom. 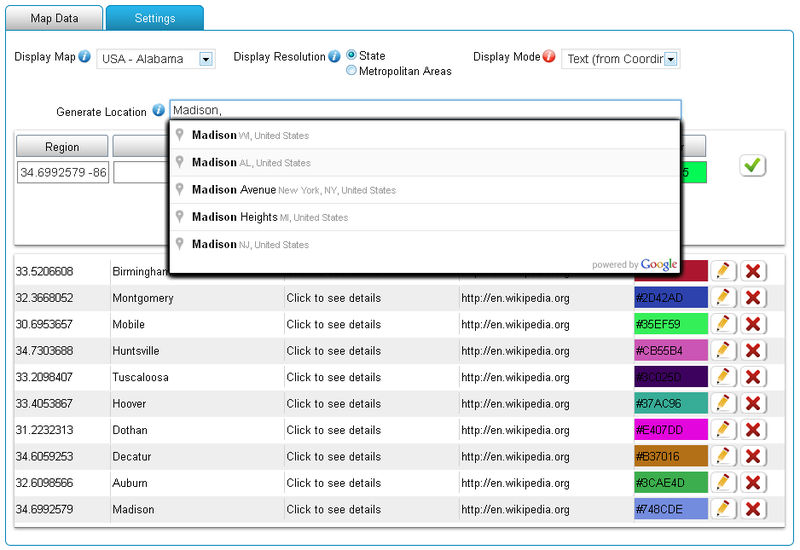 Interactive Alabama map with cities for WordPress with Text labels based on Google Geochart. This Google map of Alabama state uses option “Text labels”, which lets to show text labels in place of marker labels. Map takes labels data from each row’s Title value. Map displays largest cities of US Alabama state, based on State of Alabama Wikipedia page. Onlick of each label opens appropriate Wikipedia page in new window.